Kutztown illustration students went on a field trip to The Pencil Factory, Greenpoint, Brooklyn, to visit a great illustrator, Paul Hoppe. Paul grew up in Germany and his name is pronounced something like “Powell Hopp-uh.” He is a graduate, like me, of the MFA Illustration as Visual Essay program at SVA. He also teaches in SVA’s summer program. Paul doesn’t let the grass grow under his feet. If SVA illustration has a core philosophy, it revolves around self-propulsion. When you don’t have a job, – you make a job. I first met Paul selling his handcrafted comic zines at Moccafest. His mini-comic superheroes channel 20th century Marvel heroes, but get into NSFW jams. Today Paul works in a large shared space with other four artists on the fifth floor of the old Eberhart Faber Pencil Factory. Paul used to work from home, but he enjoys the sense of community. He has been able to grow his business to afford the studio rent. Paul was up against a tight deadline for a children’s picture book set in Brazil. He showed us his sketches for the project, Neymar: A Soccer Dream Come True by Mina Javaherbin coming in 2018 from Farrar, Straus and Giroux. We also met his studio mates, Alex Eben Meyer, Neil Swaab and Jasu Hu. We didn’t meet Jen Hill, who must have heard us coming up the stairs. Art © Jasu Hu for NY Times Book Review cover. Jasu Hu is from China. She got her graduate degree from MICA in Baltimore. She draws metaphorical figurative work. She says she does 4 or 5 commissions a week! Jasu Hu shares her editorial illustrations as Paul Hoppe gets back to work. She has an illustration each month in Oprah magazine. She showed work she does for trade magazines, the sort you don’t often see on newsstands. Come to think of it, how often do you see a newsstand? Trout done as a Wikipedia fundraiser © by Alex Eben Meyer. Alex Eben Meyer, is originally from Eastern PA. He studied at Wash U in St. Louis. His illustration style differs from his studiomates. His unlined vector images remind me of Matisse’s paper cut-outs. Alex passed around his recent sketchbooks and noted that he continues to go to life drawing classes. He was working on a big project for MIT lab and just got back preliminary images from a children’s book about the concept of opposites for Abrams. A glimpse into Alex Eben Meyer’s life drawing sketchbook. Neil Swaab shares some of the scores of books he has worked on. Coming from a Kutztown perspective, it was invigorating to see such a concentration of amazing creative talent. There are more illustrators in the Pencil Factory than in some states. Many thanks to all the artists in Pencil Factory’s Studio 515. After our Pencil Factory studio tour we walked to Transmitter Park on the East River. We spent the afternoon sketching. It was a perfect fall day. Field trip to Brooklyn as documented in Xavier Lorié’s sketchbook. Hayden Gregory sketching from the pier, Greenpoint Brooklyn. Bryan Collier is coming to Kutztown. The ‘Kid Lit’ in the headline is shorthand for “The 19th Annual Kutztown University Children’s Literature Conference” on April 1, 2017. Collier is a stellar illustrator, best know for his vibrant collage work focusing on the African-American experience, such as Uptown and Rosa. He’s won The Coretta Scott King Honor and Ezra Jack Keats Awards. Trombone Shorty, image below, is a 2016 Caldecott Honor winner. Collier is only one of the four award-winning authors and illustrators coming this year. We’ll see Caldecott Medal winning illustrator/author Lauren Castillo. In a starred review, Publisher’s weekly praised the artwork above- “Castillo conjures security with her trademark warm colors and solid black contours .” Castillo is a graduate of NYC’s School of Visual Arts and, I think, she shares a Harrisburg studio space with Jonathan Bean, who was a hit at last year’s conference. From the Animated series Max and Ruby based on Rosemary Wells’s books. Rosemary Wells is a superstar, perhaps best known for Max and Ruby picture books. Max and Ruby became a hit animated series and there is even an educational app based on the pair. Rounding out the Keynote speakers is nonfiction writer Deborah Hopkinson. She is the author of over 50 books ranging from picture books to middle-grade history titles. Besides hearing these superstars, conference attendees have a chance to join in informal chats with Aubry Joi Cohen and me. Aubry Joi Cohen is a 2014 grad of Kutztown University’s Communication Design Dept.She did a great job illustrating Seek and Find Animals Around the World while keeping her day job. Aubry is currently a designer for Artskills, an educational art firm specializing anything related to posters: poster markers, poster lettering, and decorative items like stickers. Aubry will talk about how her first book came about. She was contacted by Auzou, a French children’s book publisher, because of her artwork online. All the books will be sold at a conference discount (20% off) at the KU bookstore through April 1. The full schedule for the Saturday conference is here. A number of activities will be available free to the KU student and faculty community on Friday, March 31, info here. KU students may attend the full conference Saturday for a reduced fee of $10.00! You can show up Saturday with your student ID and register by 8:30am in the Student Union Building. All art in this post ©the original artist. From Trip to the Bottom of the World © Frank Viva. I love Frank Viva’s “Trip to the Bottom of the World with Little Mouse.” It is drawn digitally in Adobe Illustrator, yet it has a retro feel. 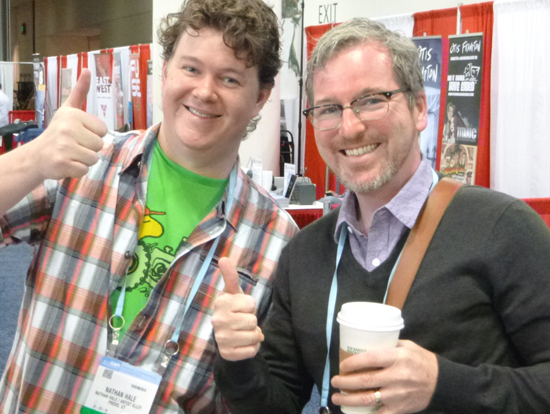 I got to meet the Canadian author/illustrator at the American Library Association Midwinter Meeting in Boston. He flew down from Toronto where he heads an award-winning graphic design agency, Viva & Co. I was blown away by his new book Sea Change. The book is getting sensational reviews for both its story and graphic design. Sea Change is a Toon Graphic title. That means it is geared toward middle-grade readers. The literary quality and the visual design is so fine that older readers will appreciate its genius. The pages of Sea Change are filled with playful typography, -the sort we read about in Phil Meggs’ History of Graphic Design. I showed my copy to Prof. Karen Kresge, who teaches advanced typography at Kutztown. She was so impressed she went directly to her computer to preorder a copy. It would be a crying shame if the design was extraordinary and the story fell flat. That is not the case here. The story is quite moving, written with an understated grace. The narrative has a great sense of place, namely, a remote fishing village in Nova Scotia. The author’s voice reminded me of Jack Gantos’s popular Joey Pigsa novels, though Viva told me he was not familiar with those books. The drawing style in Sea Change recalls Ben Shahn’s best graphic works. Viva explains that he sketches freely in pencil, then digitally colors the work in Photoshop. Besides his children’s books Frank Viva is known for his elegant design work for fortune 500 companies and many New Yorker covers. He has come a long way. He told me about his college years delivering seltzer bottles to fifth floor walk-ups in Manhattan. Oddly enough, Ontario College of Art and Design allowed him to pursue his art studies in New York City. Young Frank once thought he was headed for a career in fine art, but found work as a junior art director when he returned to Toronto. In the 70’s, he was a contributing cartoonist to the short-lived Toronto-based underground comic, “Berford Seaman’s Fabby Thighs and Butter.” I found a cover of the comic online. It bills itself as “a Canadian Magazine Everyone Can Read and Not Understand. Sea Change is an important work. It delivers a sea change from the typical design of ‘chapter books’ for young readers. I found myself totally immersed in the story, and I expect younger readers will, too. Full disclosure: I got a free advance reader’s copy of Sea Change. Not only that, Frank Viva bought me a beer on a barge in Boston Harbor. Really! However, that one strong pint at the Barking Crab did not affect this review. The Kutztown University Children’s Literature Conference is 18 years old this year. The event takes place Saturday, April 16. The beautiful poster by Christina Davies is a puzzle showing a cast of famous children’s book characters heading for Kutztown’s campus. Cover and an interior page from Jonathan Bean’s latest book. This year is a great year for illustrators. Three of the four keynote speakers are illustrators, and the fourth is married to one. Jonathan Bean, a native son of Fleetwood PA, is author & illustrator most recently of This is My House, This is My School. The Kutztown U Bookstore will have plenty of copies of this and all the titles by the conference speakers. Emily Arnold McCully, Caldecott Medalist, will share her wonderful stories, many about empowered young women. Best known for her illustrated picture books, McCully is also the author of Ida Minerva Tarbell: The Woman Who Challenged Big Business–and Won! Ida Tarbell was one the the few independent journalists with the guts to fight the most corrupt and greedy American robber barons including John D. Rockefeller. Daniel Kirk is the author and or illustrator of over 40 children’s books, including the hit series about Library Mouse. He often brings his acoustic guitar when he visits elementary schools. We will see if he sings at the KU conference. Speaking of music, Andrea Davis Pinkney is the author of Rhythm Ride: A Road Trip Through the Motown Sound. School library Journal calls it ” A well-crafted spin that will reverberate in the hearts of music, African American culture, and history buffs.” Pinkney may be one of the most famous names in the field of American Illustration. Andrea Davis Pinkney is the daughter-in-law of Jerry Pinkney and the wife and sometimes collaborator of illustrator Brian Pinkney. I’ll be there, too, launching my 2016 Real Poop on Pigeons Tour. KU MFA student Rachel Yoder will display her bilingual PA Dutch/English children’s book, Penny Olive. And Kathi Ember, KU grad will be there with lots of her illustrated books. The Real Poop on Pigeons ! Time to reveal the subject of my next book, -PIGEONS! “Robert McCloskey’s original idea for Make Way for Ducklings (1942) was to use pigeons …but he found pigeons too difficult to draw.” from Claudette Hegel’s Newbery and Caldecott Trivia. Hard to believe, but it makes me happy because my next book is The Real Poop on Pigeons! The great Robert McCloskey, no close relation, could draw anything. I sent him my 1992 kids’ book, Mrs. Fitz’s Flamingos. He sent me back an encouraging note. Now, oddly enough, I’m doing a book about pigeons. The Real Poop on Pigeons will be published by TOON BOOKS, April. 2016. We Dig Worms! was such a hit it went into a second printing just 3 months after its April 2015 release. I got a call from Toon Books’ editor-in-chief Françoise Mouly this summer. I was out, but she left a message, “We need another book, We Dig Salamanders, We Dig Birds, We Dig Something!” Got to admit, I listened to that voice message more than once. Why Pigeons? Like worms, most kids, no matter where they live, have seen pigeons. I learned about pigeons from an expert. Thanks to Holly Metz I met Vinnie Torre, one of the last of Hoboken’s great pigeon racers. Holly was editing a series of oral history chapbooks for the Hoboken Historical Museum. I visited Vinnie’s rooftop loft to research art for The Pigeon Guys. That book is available as a free ebook, here. Sometimes students ask if they should do ‘pro bono’ or free work. Well, I did the Pigeon Guys for free. I am a founding member of the Hoboken Historical Museum and think it is great place. Plus what I learned on that project inspired my own pigeon book. The research was fun. I read a number of way cool books on pigeons. I liked Andrew Blechman’s Pigeons: The Fascinating Saga of the World’s Most Revered and Reviled Bird. I loved Courtney Humbprey’s Superdove: How the Pigeon Took Manhattan … And the World. Wow, books about pigeons have long titles. I visited the National Aviary in Pittsburgh to sketch their rare Victoria crowned pigeons. I learned Picasso painted lots of pigeons. He even named his daughter Paloma, Spanish for pigeon. I bought inspiring antique pigeon prints from a Warsaw dealer via Ebay, they are chromolithographs. Some came from a lovely German book, Emil Schachtzabel’s​ 1906 Illustriertes Prachtwerk sämtlicher Taubenrassen​. The entire book can be found on Wikimedia, here. You can pre-order Real Poop on Pigeons at Amazon. It is on sale now, but they will not ship it until April. Of course, if you need a Christmas present, We Dig Worms! is available wherever books are sold. Thank you, worms, for all you have done for me this year! Did I mention this? School Library Journal chose We Dig Worms! for their Top 10 Graphic Novels of 2015. To me this is as mind-boggling as the idea that Robert McCloskey couldn’t draw pigeons. Not that Nathan Hale, Meet the Cartoonist. 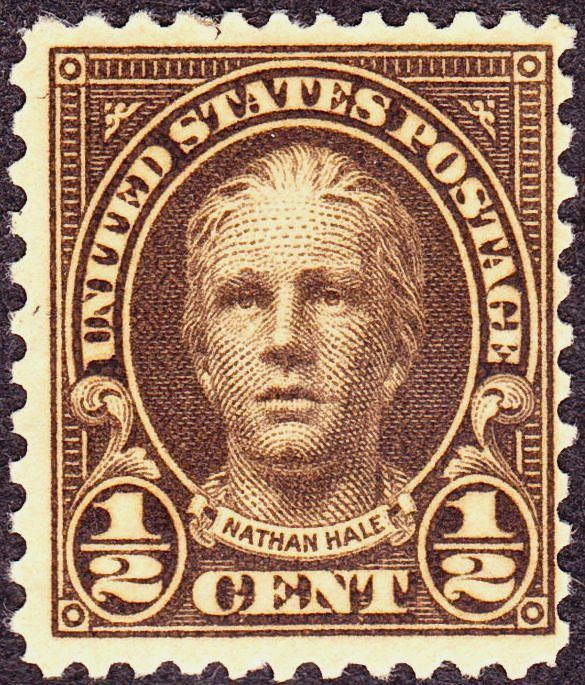 Nathan Hale, no relation. USPS. Nathan Hale is a fitting name for a graphic novelist specializing in historical biographies. I ran into him at the American Library Association convention in San Francisco. I asked if he was named for the hero of the American Revolution. He wrote One Dead Spy, about that hero. “No, I am named for my grandfather,” he said. Grandpa Nathan, born in Star Valley, Wyo, might have been named for the hero, though. Nathan Hale with Matt Phelan, two masters of the historical graphic novel. 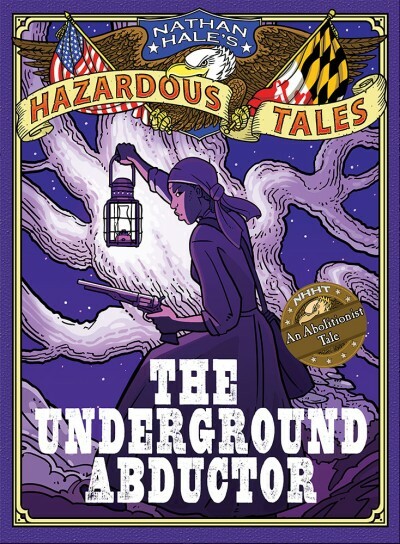 Nathan’s latest work, The Underground Abductor, is a bio of Harriet Tubman. He is hoping rumors that Tubman’s portrait might grace the ten-dollar bill come true, as it will boost sales. Nathan studied illustration at Cornish College of Art in Seattle. For a time he specialized in natural history illustration. 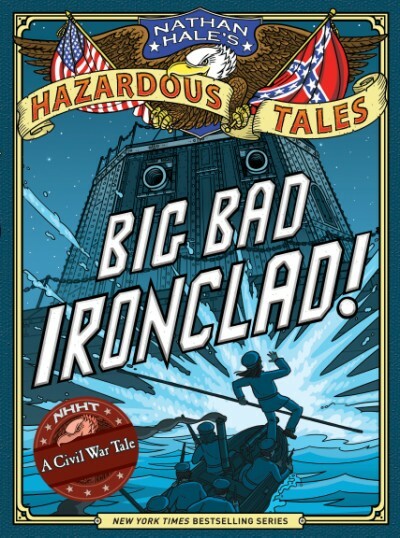 Now his historical graphic novels, published by Abrams, keep him at the drawing board. 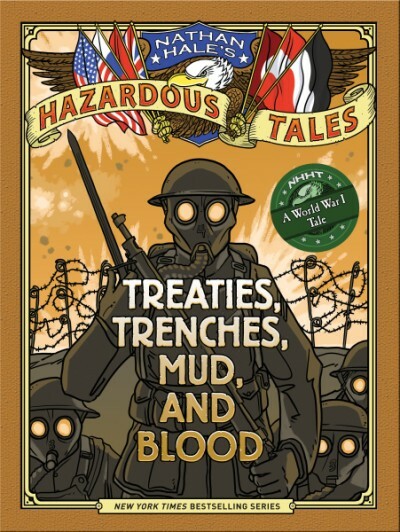 He has completed 5 in the ongoing series, Nathan Hale’s Hazardous Tales. Abrams has lesson plans linking his books to middle grade history curriculum. 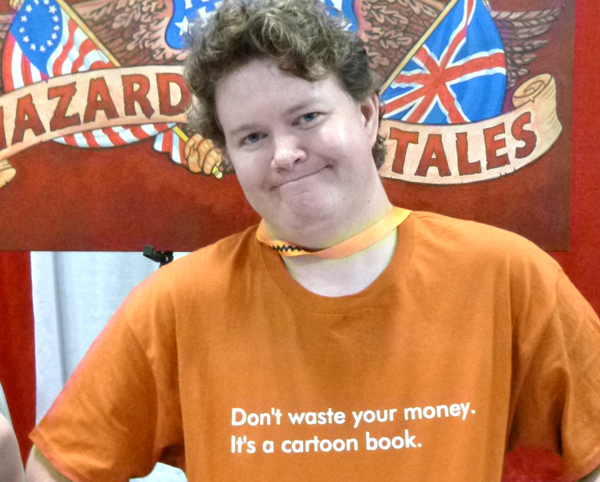 Besides his full-time job as an illustrator, Nathan tours the country teaching cartooning to youngsters in his Cartoon Boot Camp. Just prior to the ALA convention he taught a Boot Camp in Santa Rosa California at the Charles Schulz Museum. I just checked their website, looks dreamy. They have an ice rink and a Warm Puppy Cafe. You can watch Charlie Brown specials all day long and meet professional cartoonists. Oddly enough, the Boot Camp experience went south for Nathan, his wife, and eight-year old daughter, Lucy. Nathan was stunned when a thief smashed the windows of their rental car with a sledgehammer and stole their luggage. They got some Peanuts’ T- shirts at the gift shop. Nathan’s wife presented him with a nifty T-shirt she had custom printed, see below. Nathan Hale’s meanest 1-star Amazon review commemorative T-shirt. I asked if he had ever learned something from reader feedback. After some thought, Nathan opened Big Bad Ironclad! to show me the illustrated endpapers. 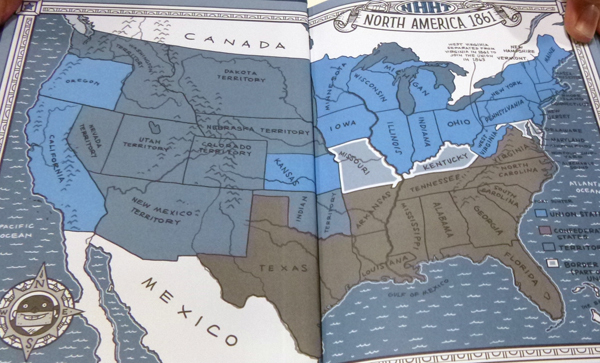 The first edition, 2012, had a mistake on the map; he had incorrectly colored Kansas gray, putting it in the Confederacy. He got a letter from an upset Kansas librarian, then more from school children. He did an apology tour of Kansas schools. “I let the kids yell at me, throw popcorn,” he joked. He took responsibility for the mistake, said he had referenced a map drawn prior to the Kansas-Nebraska Act. In January, 1861, Kansas was admitted to the Union as a free state. His publisher, Abrams, has first-rate editors who check every sentence for historical accuracy. Nathan, however, never sent the editors the illustrated endpapers to proofread, just the interior pages. The map was fixed for the current edition, pictured below. Let that be a (history) lesson for us all. Nathan writes a blog, Space Station Nathan. He admits to being too busy to keep it updated. He works hard and deserves his success. The blog archives have some nifty stuff. Look for the illustrated guide to inviting Nathan Hale to visit your school.